Mexi-CAN I have some MORE! This is one of my fav flavour combos and freaking love taco Tuesday, which this Chicken is perfect to add. Not only is this a flavour-bomb BUT it has anti-inflammatory spices for that extra nourishment hit. Arguably, the most powerful aspect of curcumin (main healing compound found in Turmeric) is its ability to control inflammation. It can help ease joint pain, IBS, arthritis and other inflammatory diseases. Cayenne Pepper provides detox support by assisting the digestive system to move bacteria and toxins out of your body. It also stimulates your circulation system. Another reason I love this dish, is you can add salad, veggies, chippies! You name it BUT my favvvvvv is lettuce cups and a salsa! To make the most epic Tacos. 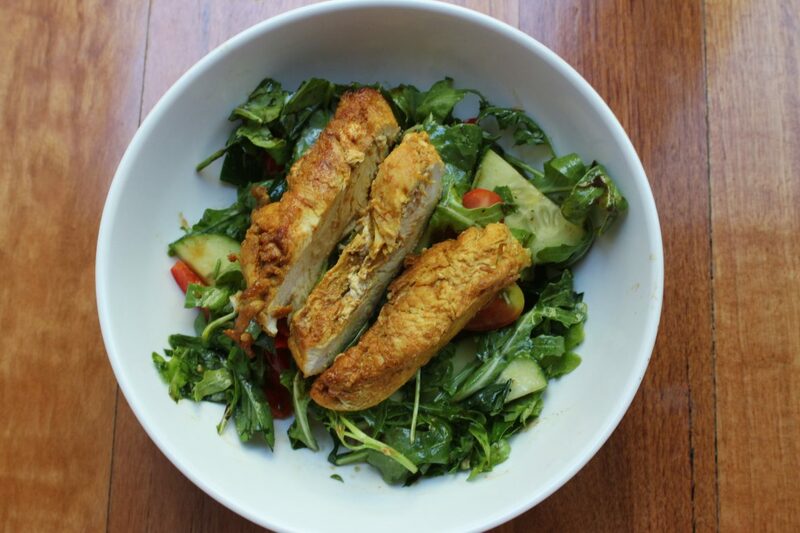 You can even pair the chicken with The Super Simple Summer Salad! Combine in large bowl, Smoked Paprika, Tumeric, Cayenne Pepper, Garlic and Coconut oil. Add Chicken Breasts or tenderloins. Marinate for 2 hours… or if your short on time and need to whip these up after work, the flavours stick instantly and will still be super yummy! On a medium heat, cook the chicken breasts approx.. 5-6minutes each side. Depending on thickness.